When I was a little girl, I absolutely loved playing with my dolls. In fact I would spend hours upon hours in my bedroom, feeding them, changing their nappy and their outfits and pushing them around in a little dolls pushchair I had and believe it or not - one of my favourite dolls as a child was my Baby Born. 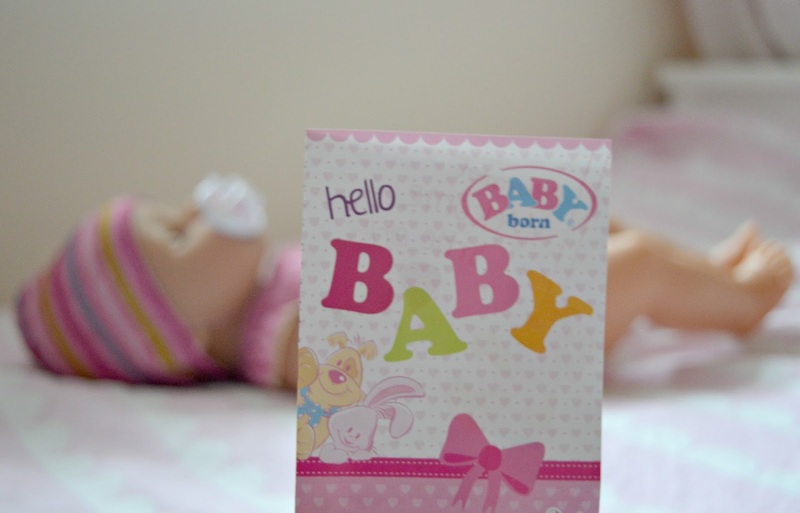 So you can imagine how excited I was to be given the opportunity to review the new Baby Born Interactive Doll, and for Sophie to have one of her very own. It feels quite nostalgic actually, as I have so many fond memories of my childhood playing with my Baby Born and going to pick new outfits for her. So watching my own little girl play with the same doll I did all those years ago, is really lovely. When it arrived, Sophie was so excited and couldn't wait to get her out of the box. I think she looks really sweet and I was pleasantly surprised at the amount of accessories included too. 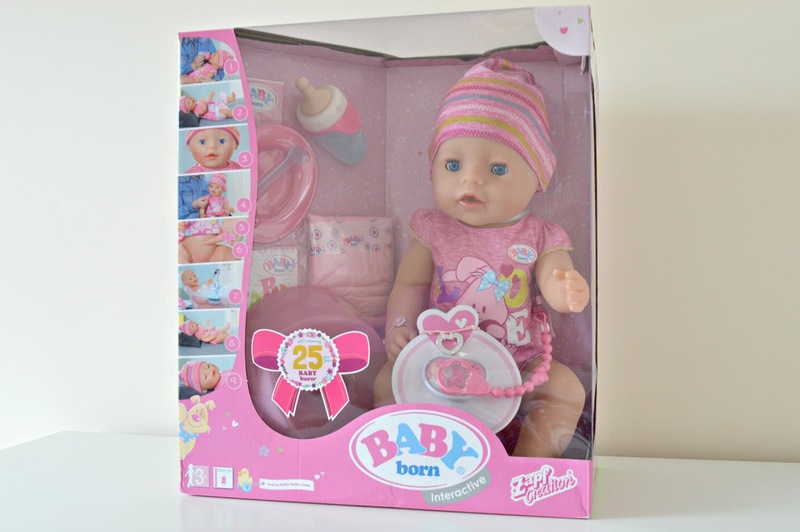 The box contains: Baby Born doll with bodysuit and hat, dummy and dummy clip, nappy, bottle, sachet of baby food, bowl and spoon, potty, two bracelets - one for Baby Born and a matching one for your child, as well as a birth certificate. Which I think make such a lovely touch. Baby Born has nine realistic functions - she can open and close her eyes, cries real tears, she can move her head, arms and legs, drink from her bottle, eat porridge, wet her nappy, use the potty by pressing her belly button, and as she is hard bodied - she is bathable too. I think the best part is - no batteries are required! Although you do have to clean the doll after giving her food and bathing her - but this does sound pretty straightforward if you follow the instructions in the manual. Sophie is almost three and a half years old now and with the doll suitable for children age 3+, it really is the perfect age for her. She loves role-play toys and this is perfect for developing her imagination. She loved giving her baby a dummy, changing her nappy, feeding her, and then pushing her belly button and watching her do a wee on the potty. She has the older version of Baby Annabell which we bought last year for her birthday, which can't use the potty - so she was quite excited by this new function! As you can see, she has been a big hit with Sophie! 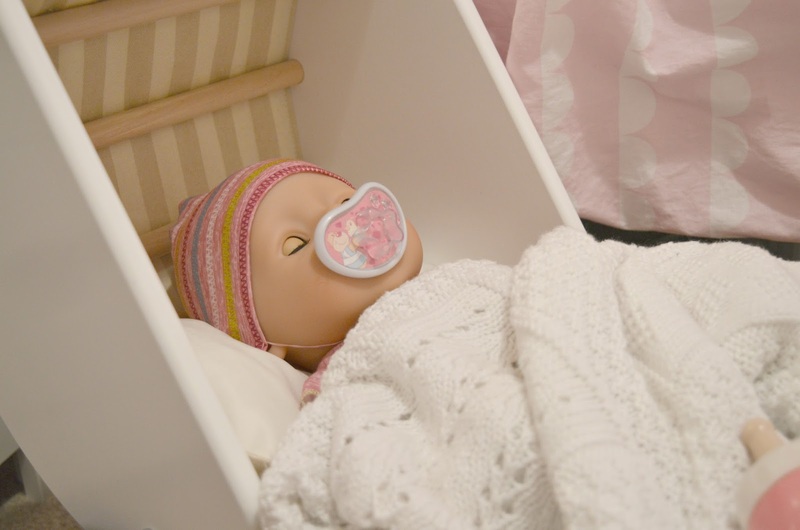 If you're looking for a new baby doll for your child, I would definitely recommend this one and it would make the perfect gift for Christmas too! The Baby Born Interactive Doll has a RRP of £44.99 and is available in a baby boy version too. You can also purchase separate clothes and accessories, including nappies and baby food from most large retailers. I hope you enjoyed reading this review and found it helpful. What are your thoughts on the new Baby Born doll? Disclaimer - we were very kindly sent the item above for the purpose of this review. However, opinions are my own and 100% honest. Wow she's comes a long way. My little one has one but she not really a baby doll playing kid. Shame really, I love baby born! My girls really want a doll where you can change their nappy as they think that's the most important part of being a mummy!! A bit different to the baby born I had when I was a child. I think chloe will enjoy this doll when she's at the age.